Drive-In Racks allow a lift truck to enter the rack from one side to pick up or pull out pallets. This is done because pallets can slide backwards on a continuous rail. Forklifts drive into the rack to access pallets two or more deep. 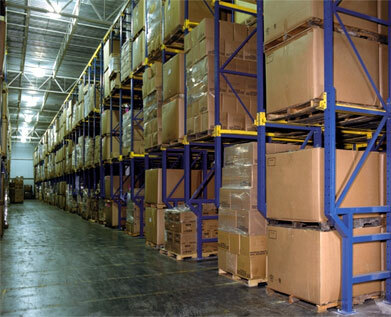 You are limited in the depth of storage for a particular bay by the size of your facility. Drive-In racks are typically subject to more abuse than selective racks due to the way they are utilized, so rack integrity and strength are important factors. It is ideal rack for cooler or freezer applications. Drive-In & Drive-Through Racks offer the ability to store a large amount of similar loads in a smaller area. Selectivity is sacrificed, but storage density is outstanding. Drive In Racking can store up to 75% more pallets in the same space than selective racking -- depending on your application. It requires fewer aisles and is better cubic storage. 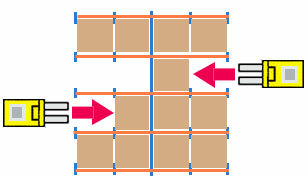 Note that many drive in applications can increase their flexibility and storage density by utilizing Flow Rail horizontal pallet flow lanes. You can retrofit most existing rack systems with this new storage technology. Single Entry Racks - lift trucks can enter the rack from only one side. Double Entry Racks - lift trucks can enter from both sides or a row of racks. 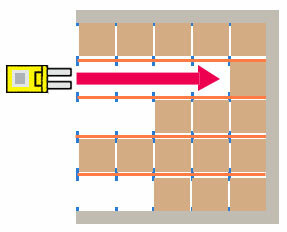 The center of the rack row is stabilized by a beam. When should you specify Drive-In Racks? Drive-In Rack is used to store many pallets of a similar SKU or product. Lift trucks drive into the rack to extract the first pallet they come to. This is "Last-In, First-Out" storage. We've installed Drive-In and Drive-Through Racks in a number of cold storage applications, due to the need to store as many pallets as possible in as little expensive freezer space as possible.